I have my go-to zucchini bread — err, actually cake — recipe, but it’s nice to switch it up sometimes. 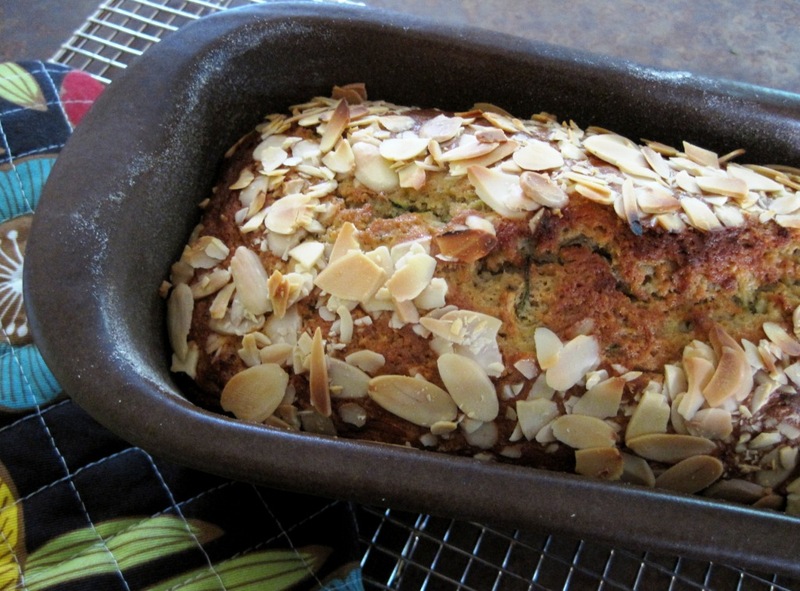 Now that the zucchini in the garden are finally abundant, I’m stocking up the freezer with this almond zucchini bread. The recipe is super easy. Like muffins, it’s the mix-wet-ingredients-mix-dry-ingredients-combine method. The resulting cake is moist, with an even texture and a pleasant almond flavour. 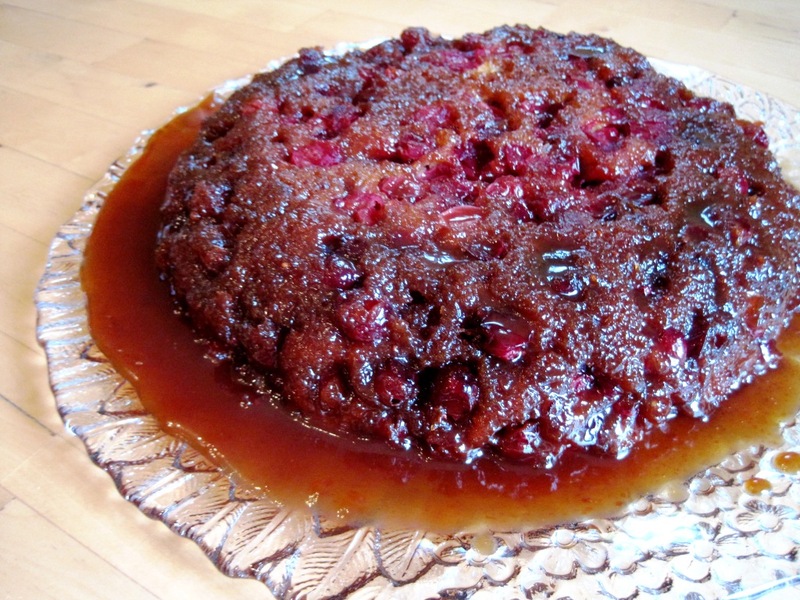 This recipe is adapted from a blog called Whet Your Appetite. I’ve significantly reduced the sugar, because I prefer my cakes less sweet, and the other flavours can shine through. I make this recipe into two medium-sized loaves, but I imagine you could also bake one large cake. Preheat oven to 350°F. Butter two loaf pans. Combine flour, baking powder and salt in a bowl. In a separate bowl, mix eggs, sugar, oil, yoghurt and almond extract. Combine wet ingredients with dry; do not overmix. Fold in grated zucchini and ground almonds. Pour batter into prepared loaf pans. Sprinkle with sliced or slivered almonds if desired. 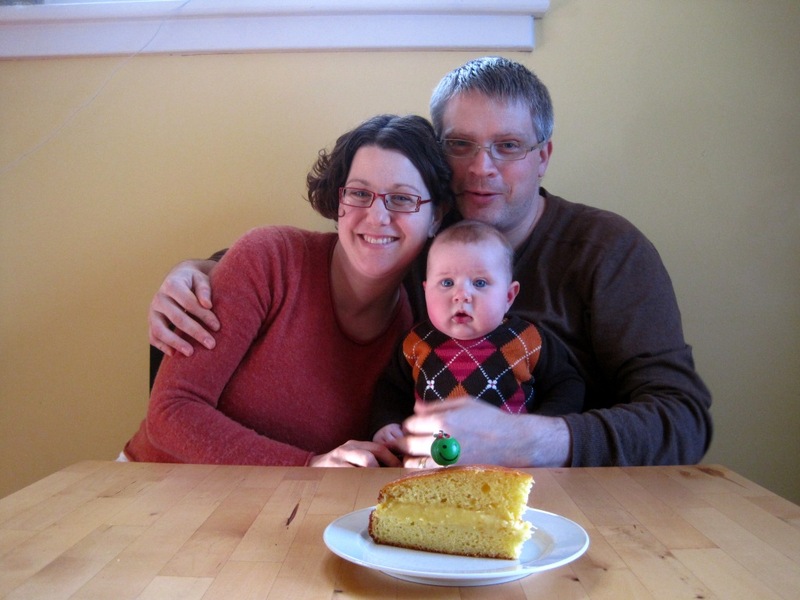 Celebrating Baby's 6-month milestone with Orange Celebration Cake. Oops, forgot to light the candle! Chalk another one up to mommy brain. Usually I pay no attention to half-birthdays, but I think a baby’s first year is different. The 6-month milestone is worthy of celebration for both Baby – even though she won’t get to eat any cake – and the new parents – who will happily eat Baby’s piece. Baby has come a long way: from practically helpless to a bright baby ready to discover anything within reach and a bit beyond. At birth, her main (and most amazing) skill was knowing where and how to get food. Today she is sitting quite well on her own (with an occasional topple), grabbing objects accurately and passing them from hand to hand, communicating in her own way with a range of sounds, and starting to explore solid food. She’s gone from 3.9 kg and 52 cm out of the womb to approx. 9 kg and 71 cm in six months! Meanwhile, the new parents have survived the first six months relatively well. We’ve tackled the steep learning curve, adapted our lives, overcome a lack of sleep (not to say we don’t still suffer from it), created strong (and stronger) bonds, laughed and cried. Of course these things are all ongoing, but it’s a lot all at once at the beginning. I think we can be proud of how we’ve managed. We certainly enjoy the company of our happy, thriving baby! The moment has come to broaden the focus of this blog. I realize that being a mother is an important part of who I am and influences the way I look at things. Motherhood is giving me a new angle from which to experience, and write about, the activities I enjoy. I’ve decided to rename my blog “Thrive” to better reflect this broader focus (without changing the URL for now). I want my family and me to thrive through healthy, happy eating and togetherness in the kitchen, in the garden and wherever life may take us. I aim for my garden to thrive and provide us with fresh foods we can feel good about eating. All that to say: I’m baking cake to celebrate! Orange Celebration Cake is one of my favourites. I have no idea where the recipe came from, just that it was part of my mom’s collection and has been in mine for at least 15 years. Its bright and refreshing flavor and naturally sunshiny colour is particularly appropriate for this time of year. Baking this cake perks me right up. The aroma that pervades the house while it’s baking (and after) is wonderful and warming. It really sets the mood for celebration! I recommend making this cake the day before you plan to serve it, so the orange aroma has the time to “open up.” Quantities in weight – scale required! Preheat oven to 350° F. Line a 9-inch cake pan with parchment paper and grease the sides. In a small bowl, combine flour, baking powder and salt. In large bowl, cream butter. Add sugar and orange zest. Continue beating until light and fluffy. Beat in one egg at a time. Mix in flour mixture and orange juice, alternating between the two: flour – orange juice – flour – orange juice – flour. Be careful not to overmix. Pour batter into cake pan. Bake 30-40 minutes or until golden brown and cake tester comes out clean. Remove from oven and let cool before removing from pan. Slice cake in half horizontally. Prepare filling. Combine flour and sugar in a saucepan. Whisk in orange juice making sure there are no lumps. Mix in egg yolks. Start heating mixture over medium-low. Add butter once the mixture has warmed up a bit. 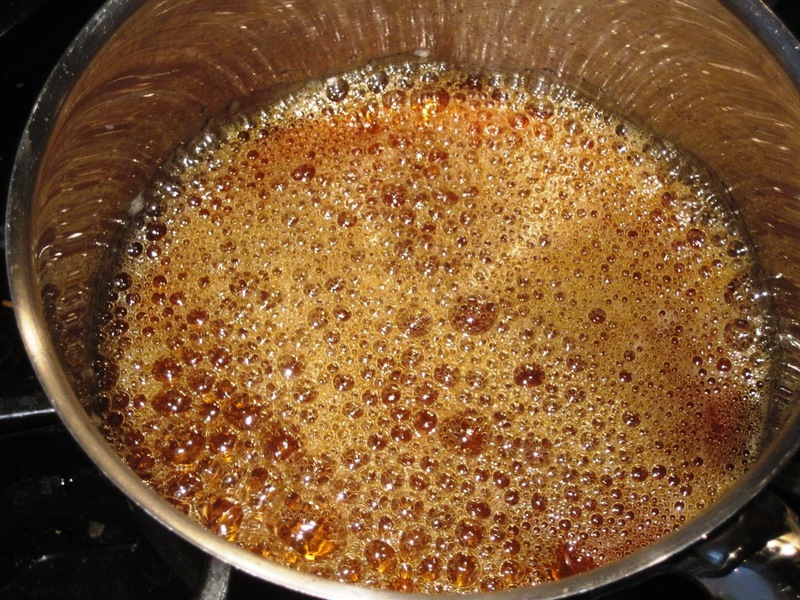 Continue heating while whisking continuously until the mixture thickens to the consistency of runny jam. 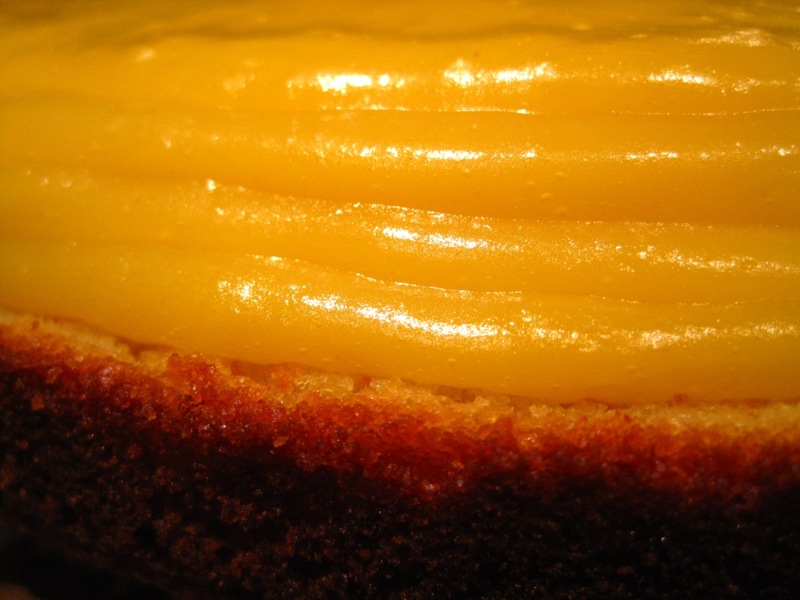 The four layers of orange curd filling, each one set separately, are visible before replacing the top half of the cake. 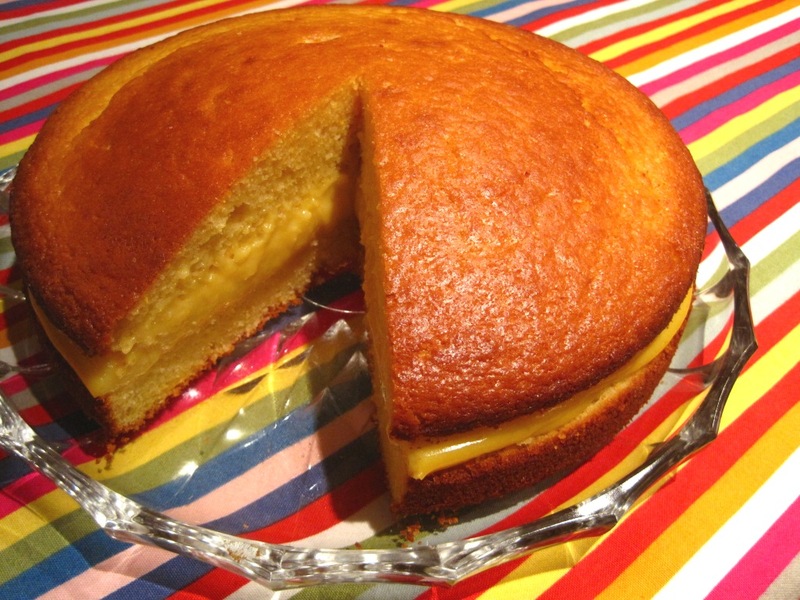 Carefully pour one quarter of the orange curd onto the bottom half of the cake and spread to close to the edge. Allow to set slightly (a couple of minutes). Repeat until all the filling is on the bottom half of the cake. Allow to cool and set completely (approx. 30 minutes) before placing the other half of the cake on top. Filling the cake in four steps will prevent the orange curd from oozing out when you replace the top half of the cake and let you make a generously filled cake. 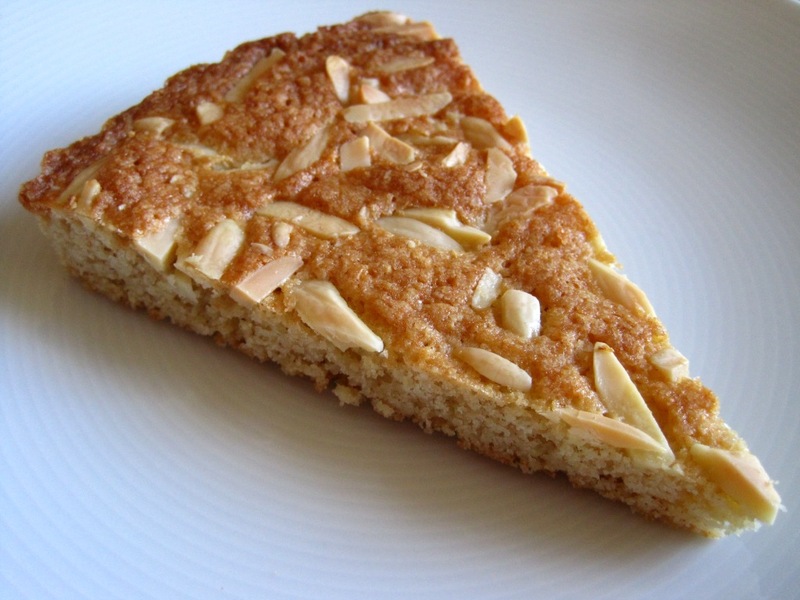 I make this almond cake when I’ve volunteered to make dessert, but end up with little time (and/or energy) to make one. By no means though, do I consider it a lesser dessert. It’s just quick and easy to make, has great flavour and texture, and I’m likely to have all the ingredients on hand. It’s also, interestingly, always popular with the men. 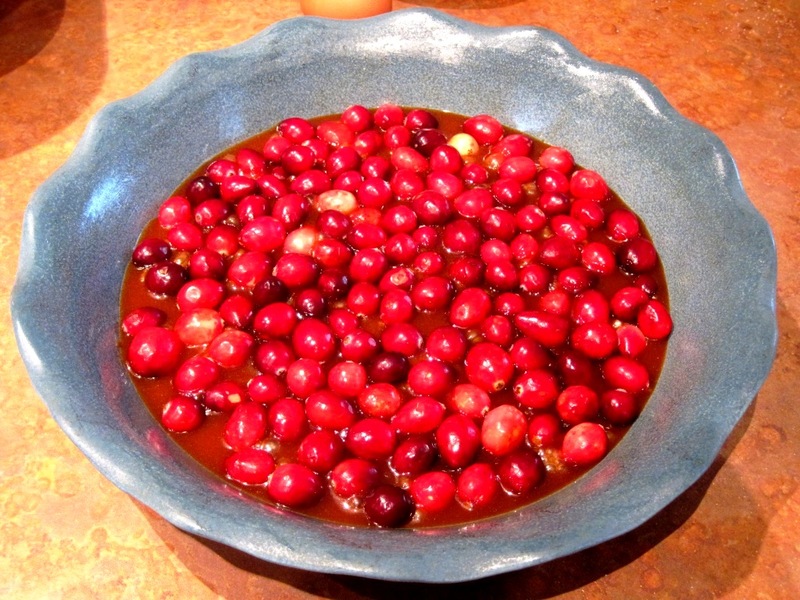 Although perfectly satisfying on its own, it would also go well with fresh (sliced) seasonal fruit or a fruit compote. Preheat oven to 350° F. Butter an 8-inch pan with a removable bottom (not a quiche pan, but a spring-form pan). Using a wooden spoon, mix all ingredients (except for sliced/slivered almonds) together in a bowl. Spread batter in baking pan. Sprinkle with sliced/slivered almonds. Bake 20 – 25 minutes or until golden. Beat butter with electric mixer. Add sugar and continue beating until light and fluffy. Beat in egg (no need to beat lightly in advance if using this method). Add flour (flour mixture) and mix until combined. Spread batter in baking pan. Sprinkle with sliced/slivered almonds. Bake 20 – 25 minutes or until golden.